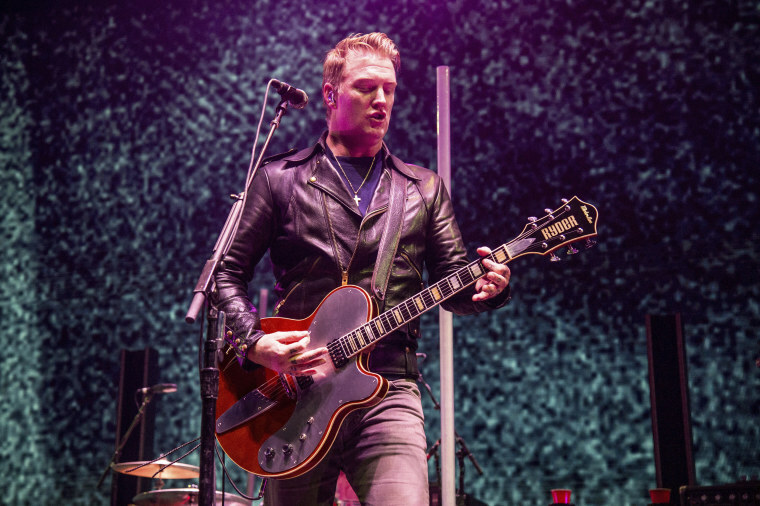 LOS ANGELES — Queens of the Stone Age frontman Josh Homme apologized Sunday for kicking a photographer in the face during a performance. Chelsea Lauren, a photographer for Shutterstock, which has a licensing partnership with Variety owner Penske Media, said that the incident during the band's performance at Los Angeles radio station KROQ's annual holiday concert on Saturday was entirely unprovoked and that Homme was even smiling before he struck her. "It was obviously very intentional," she said. Homme released a statement Sunday characterizing the incident as an accident. "Last night, while in a state of being lost in performance, I kicked over various lighting and equipment on our stage," the statement reads. "Today it was brought to my attention that this included a camera held by photographer Chelsea Lauren. I did not mean for that to happen and I am very sorry. I would never intentionally cause harm to anyone working at or attending one of our shows and I hope Chelsea will accept my sincere apology." Lauren was on one side of the stage while three other photographers were together on the other side of the stage. In the video, Homme can be seen walking past Lauren, then backtracking a step to kick away her camera. "Josh was coming over, and I was pretty excited. I've never actually photographed Queens of the Stone Age before. I was really looking forward to it. I saw him coming over, and I was shooting away," Lauren said. "The next thing I know, his foot connects with my camera, and my camera connects with my face really hard. He looked straight at me, swung his leg back pretty hard and full-blown kicked me in the face," she said. "He continued performing. I was startled. I kind of stopped looking at him. I just got down and was holding my face 'cause it hurt so badly." A visibly distraught Lauren returned to the press room with tears welling up in her eyes. When several people asked her what happened, she said, disbelief still in her voice: "Josh kicked me in the face. Who does that?" Backing up her claim that several audience members saw it as it happened, a rep from KROQ in the press room received a text from someone sitting in the seats above asking, "Did the guitarist for Queens Of The Stone Age kick a photographer in the face?" Lauren stayed to shoot "Thirty Seconds to Mars" and "Muse," but she went for treatment later Saturday night at Cedars-Sinai Medical Center. "I feel like if I don't do anything, he gets to walk around and kick people in the face and not get in trouble because he's a musician," Lauren said. "That's not right." It's unknown whether Homme, 44, was under the influence of alcohol or drugs on Saturday. At one point, he called the sold-out audience "retards" before insulting the night's headlining act, Muse. "F--- Muse!" he exclaimed. He also encouraged the crowd to boo him and told everyone to take their pants off, saying, "I want to give you all a night you'll never remember." In the press room, before Lauren returned and told everyone what happened, people jokingly questioned, "What is he on?" A rep for the Queens of the Stone Age could not be reached for comment. Lauren, who spoke to Variety immediately after the incident, as well as over the phone on Sunday morning, said she planned to return to the Forum to shoot the final night of KROQ's gala on Sunday, which featured the Killers, Weezer and Phoenix. She added: "I really love shooting music, and while I feel awful today, if I stop for him, then he wins." She was reminded that her injury was a bizarre and unfortunate circumstance on a night when everybody else seemed to be in great spirits. "I was getting on the elevator when I walked past Tim McIlarth from Rise Against," she said. "He smiled at me, and I was reminded there are a lot of good guys in music still."